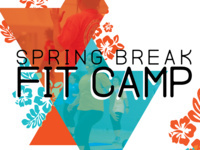 Get ready for spring break with this boot camp style class that will help you shred, tone, and grow your confidence. This 6-week class includes six workouts for a total of $15. That is less than $3/class to work with a certified trainer. Mondays, 5:15 - 6 p.m.
Found out that I can make a "sweat angel" Just what I needed to get motivated about exercising!